The End Times are upon us, and the Warhammer world falls into ruin. 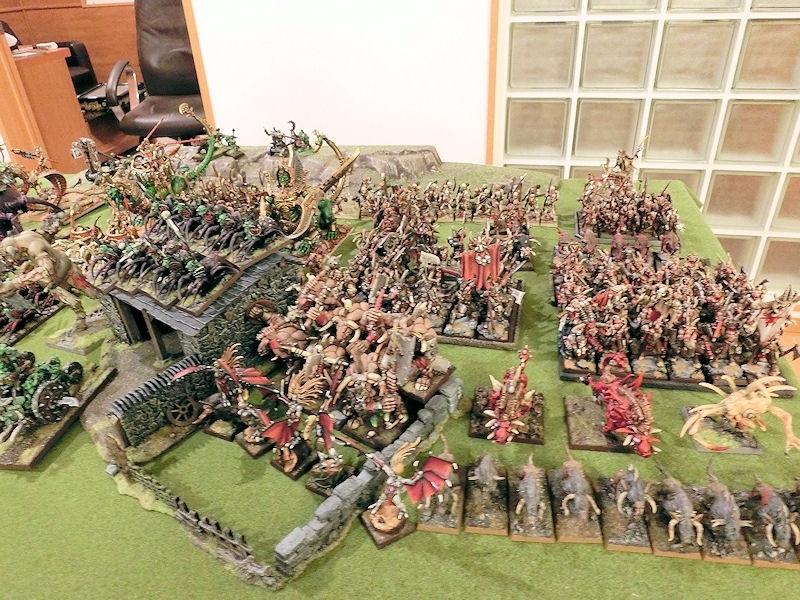 What better way to celebrate the new Age of Sigmar skirmish-level game, than by chucking every painted model I have into one HUGE battle, and playing it using the now defunct 8th edition rules?! I did a model count before the game kicked off, and it came to 1483 models on the table (plus a few fanatics and assassins etc). I'm fairly sure that nobody playing Age of Sigmar would be able to manage that and retain their sanity! Absolutely no idea about the points values - it seemed a moot point. I just threw all my painted armies on either the GOOD or EVIL side, and then divided up the neutrally-aligned forces between them where space allowed. Only 4 characters had magic items in the whole game, each side got one 4+ ward save and one 5+ ward save for a character. And that was it! So here's a table-wide shot of the armies after they'd been deployed. 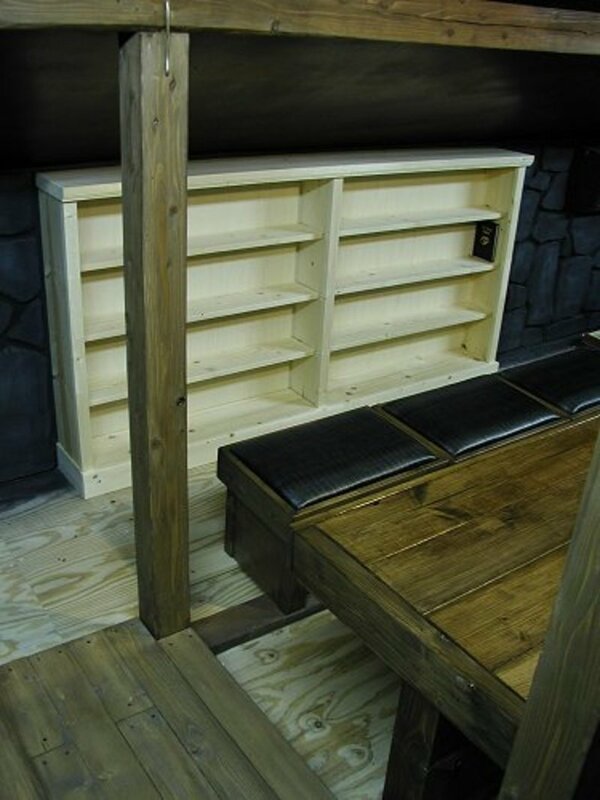 That's a 6 by 8 foot table, by the way! ... and a total of 8 wizards (all level 2). The evil side outnumbered the good side by about 830 to 630 models, but would numbers be enough? My sanity wouldn't survive detailing every twist and turn of this massive game, so I will just jump through some of the stand out points of the game, which was played between myself and ..... myself.... plus Euan (now aged 10) when available! The opening skirmishes of the game all involved the vanguard units, with the GOOD forces gaining the upper hand. I now realised what a mistake it had been to put such poorly led units so far out in front, as the inevitable panic tests from shooting took their toll. 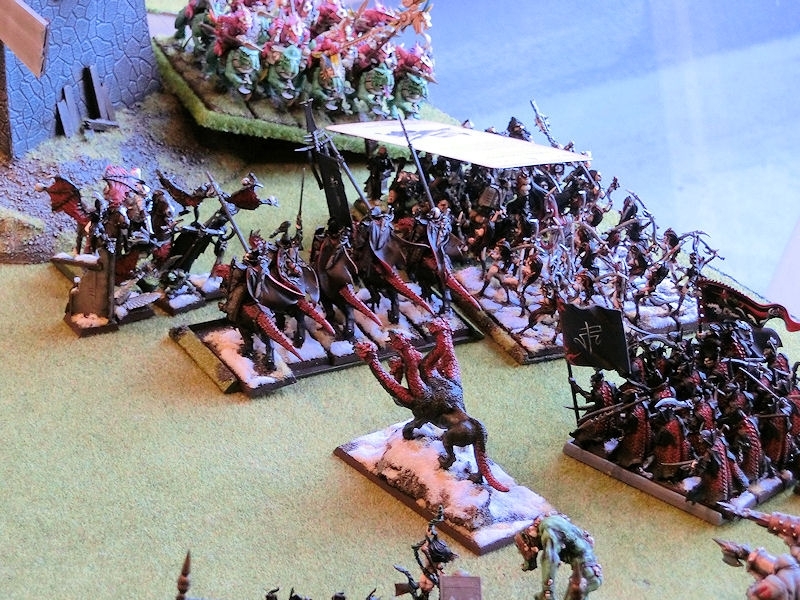 Most of the goblin skirmishers managed to flee through their own lines about 24" before finding empty space! Look! Some empty space! After turn one the EVIL side had all moved speedily forward, keen to get to grips with the forces of GOOD. You might be mistaken for thinking that this was a dull "charge the gunline" kind of situation, but in fact the EVIL side had the GOOD warmachines outnumbered right from the start, and this became even more one-sided after the Empire mortar exploded first turn and their great cannon was taken out by a very accurate rock lobba shot. Having dealt with the EVIL side's vanguard units, the next job for the GOOD fast cavalry was to stem the tide of random movement death spinning fast towards them. 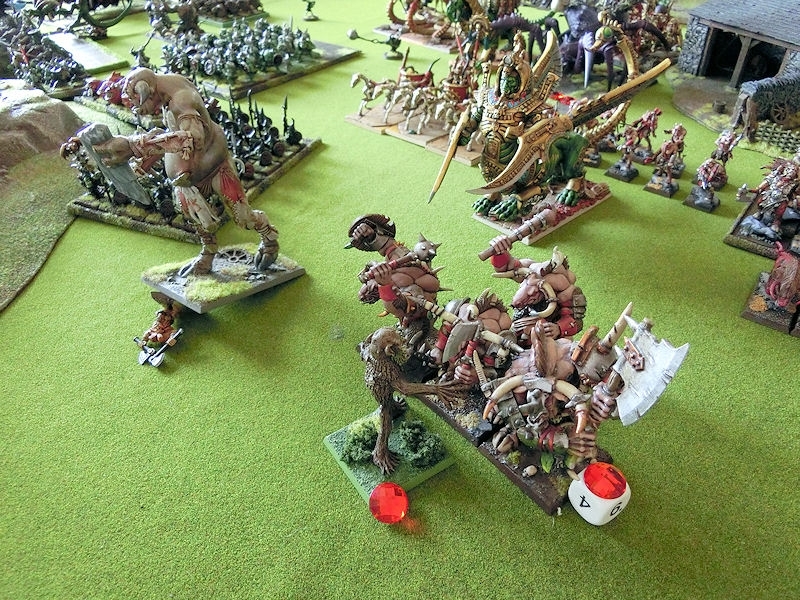 7 fanatics, 2 mangler squigs and 2 pump wagons were soon pulled out of position, at the cost of only one glade rider. 6 of those fanatics then ploughed straight back through their parent units, smashing corpses around for much of the rest of the battle! Of those deadly units, only one snotling pump wagon made it as far as the enemy lines, and had the time of its life! 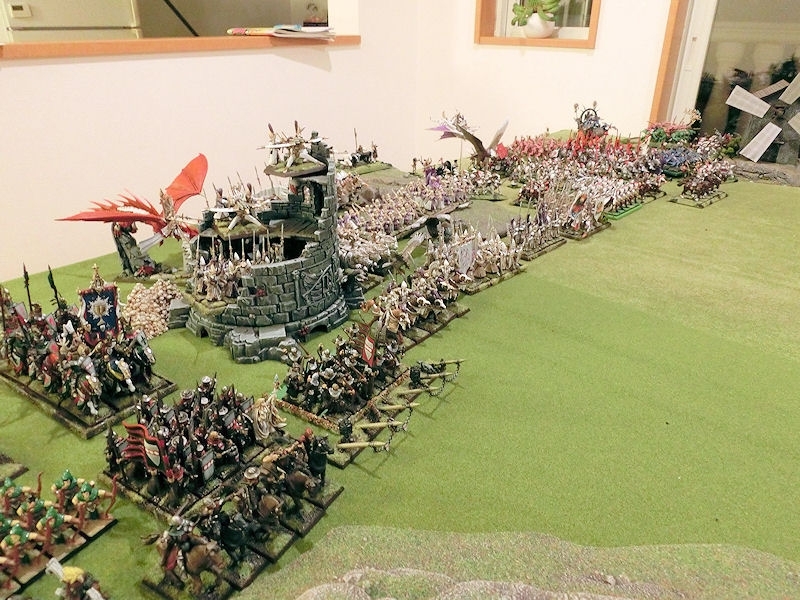 It quickly amassed a tally of one giant eagle and 20 glade guard before colliding with wood elf elites. This was the first turn view from the windmill over on the GOOD side's left flank. 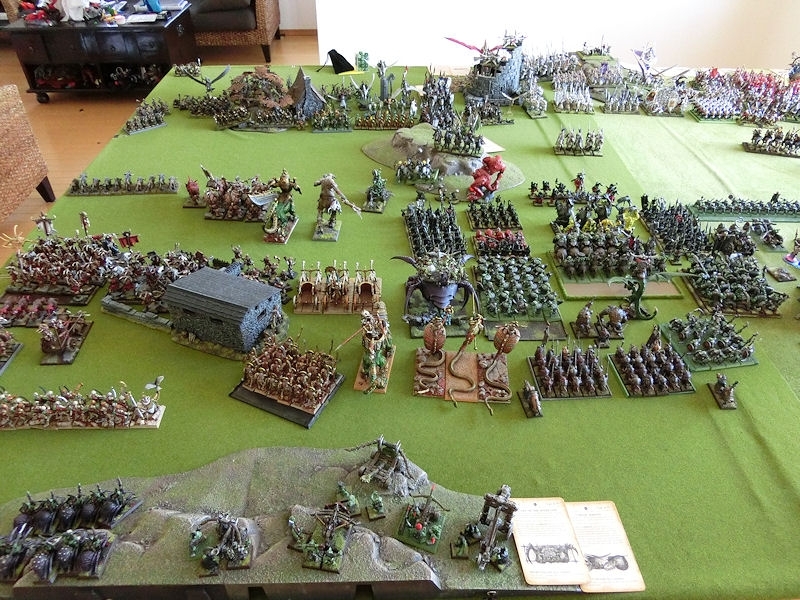 Just out of view on the extreme left are at least 10 more Dark Elf and Ogre units charging straight towards them! In this turn 2 photo, you can see some of the forward elements from both armies closing in for the kill. With so many juicy targets for the war machines to choose from (not to mention the limited visibility), most of the large monsters made it into combat without harm! Here you can see the Wood Elf attempts to slow down the rampaging minotaurs, giants, necrosphinx, trolls and other nasties. 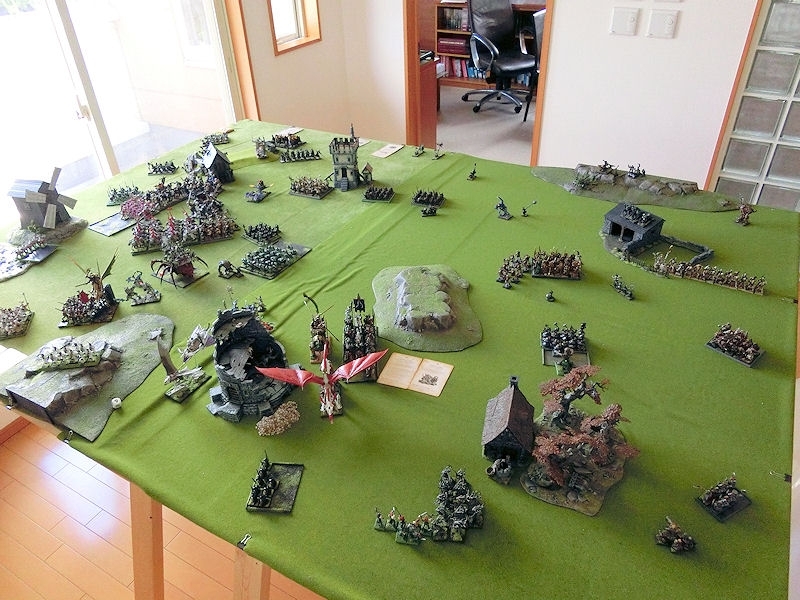 Another turn 2 photo, this time of the other end of the table. 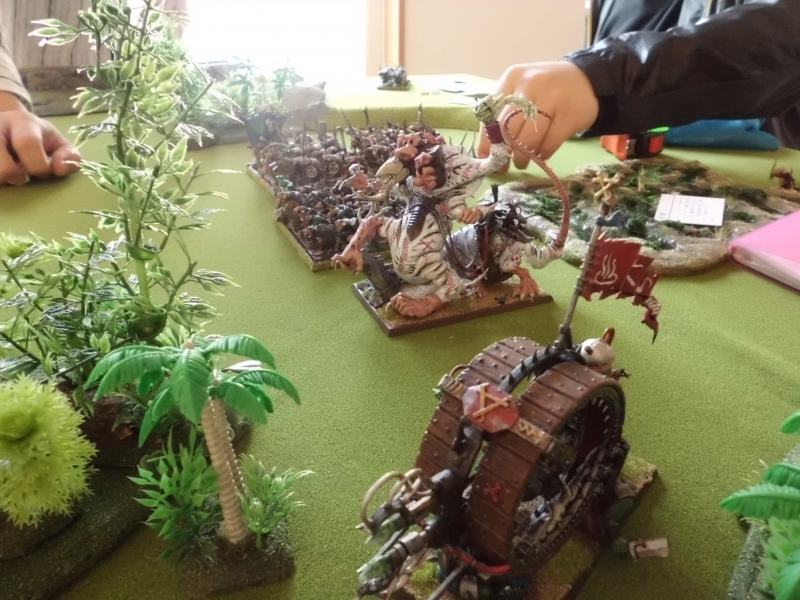 This turn saw my first experience of a cunningly-used Hand of Gork spell, to push the large unit of trolls out of the charge path of those Lion Chariots and into something much more mouth-watering! This was the quiet before the storm. 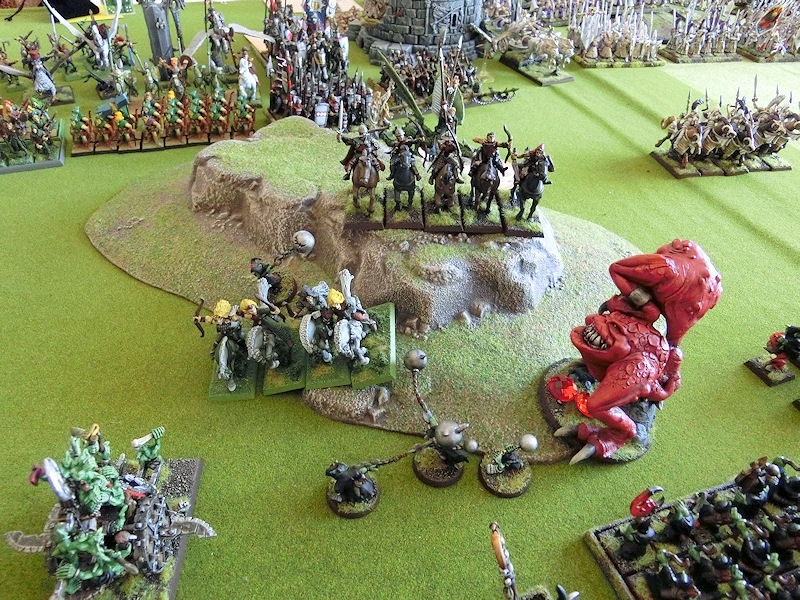 The next turn saw charges from the chimera, giants, trolls, forest dragon, and several chariots. In the shadow of the windmill, we saw charge and countercharge, with the Empire flagellants destroyed by Witch Elves and Cold One Knights, who were in turn charged and fled from the wrath of the Lizardmen knights. This caused panic to ripple out and saw the hydra and corsairs turn tail and flee, only to return again in the following turn. In an attempt to buy more time for the GOOD side, turn 3 saw two brave charges from the giantslayer hero (into a giant) and from the lone Treeman (into 5 angry minotaurs). The giant probably didn't even notice the dwarf giantslayer being squashed under his feet as he marched, but the Treeman successfully fought off the minotaurs for 3 combat phases before finally breaking them. He was left on one wound, but his success tore a large hole out of the EVIL side's left flank due to knock on panic. In turn 4 we witnessed maybe the pivotal moment of the game, as a brave countercharge by Prince Tyrion and his Silver Helms failed to budge the rampaging Arachnarok. What should have been an easy victory turned into a nightmare battle when Prince Tyrion failed his fear check (Ld 10!) due to the loss of their battle standard re-roll in the previous round. 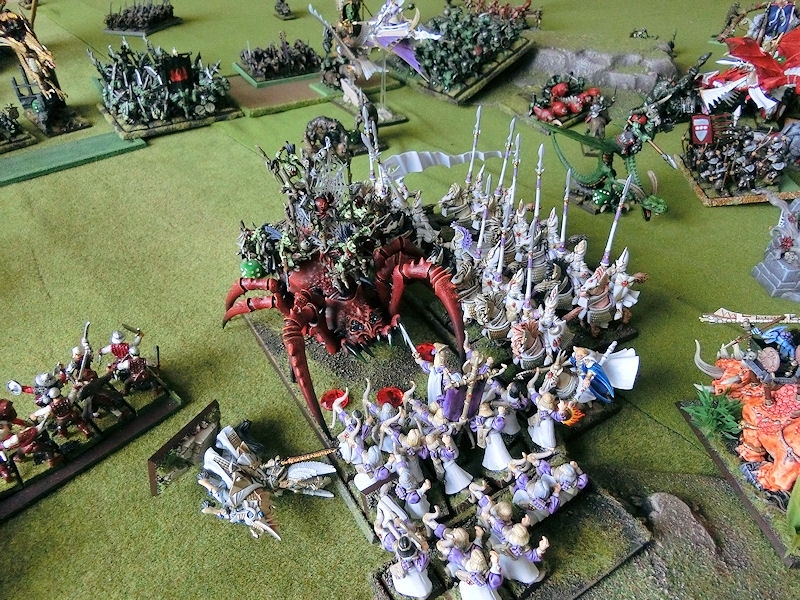 His knights only managed 2 wounds on the massive spider, and the Arachnarok retaliated by pumping Tyrion full of super-venom. He rolled a 1 for his armour save, followed by a 1 for his ward save, and then the spider rolled the maximum 6 damage for that single attack!! The mighty Tyrion fell, and with it died his unit's chance to kill the beast and reform to face the rampaging Orc Warboss. He charged into their vulnerable rear in the next phase, and both high elf units were broken and run down - thereby tearing out the centre of the GOOD battlelines. With the loss of Prince Tyrion's main units, the game was split into two halves. The left flank still had its champions from the GOOD side. At the close of turn 6 we could still see a large intact block of Empire Knights trying to cut their way free of numerous foes, and a tough block of Lizardmen infantry trying unsuccessfully to chew their way through the elite Chaos Knights. But the GOOD countercharge here had failed to inflict the panic they needed, and the day was lost! The GOOD side successfully retook their right flank by well timed counter charges by knights and dwarfs (! ), breaking and destroying the undead units surrounding a very hard-pressed Treeman. 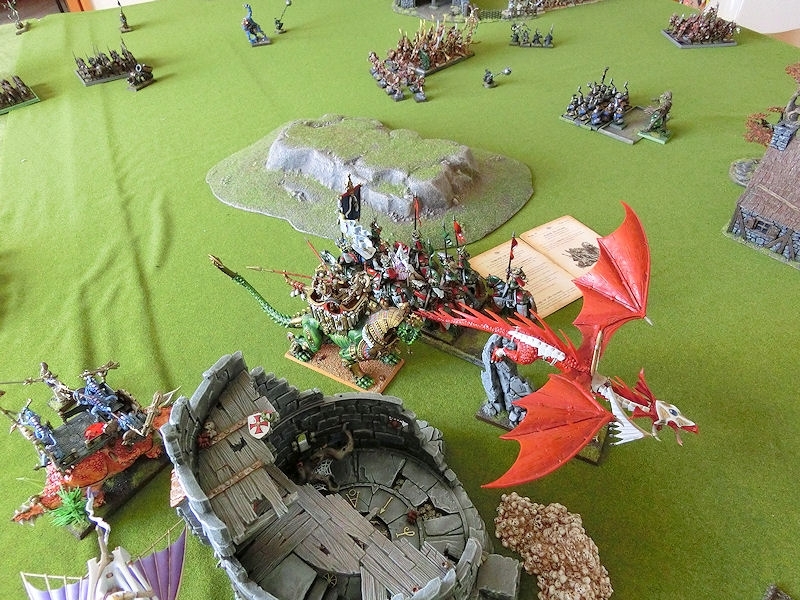 The High Elf dragon had fought the trolls bravely for 6 rounds of combat and eventually destroyed them, but at last fled from the charge of a Tomb Kings warsphinx. 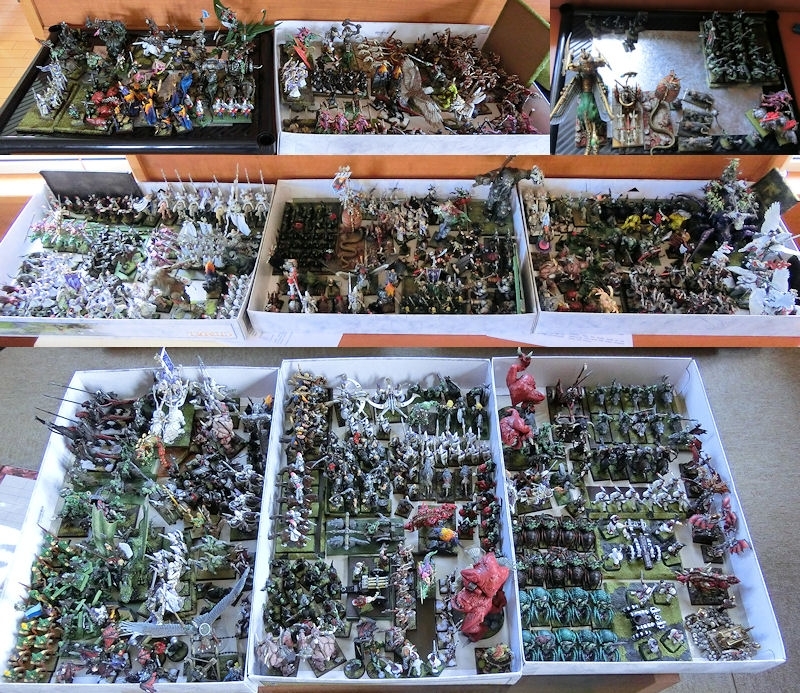 All of these 9 boxes of models fought and died, making up perhaps two thirds of the total model count. It certainly was a battle to end all battles. Only time will tell whether that was the last big battle I will get to play, and whether Age of Sigmar's smaller scale style of play will become the norm. Personally, I hope not. 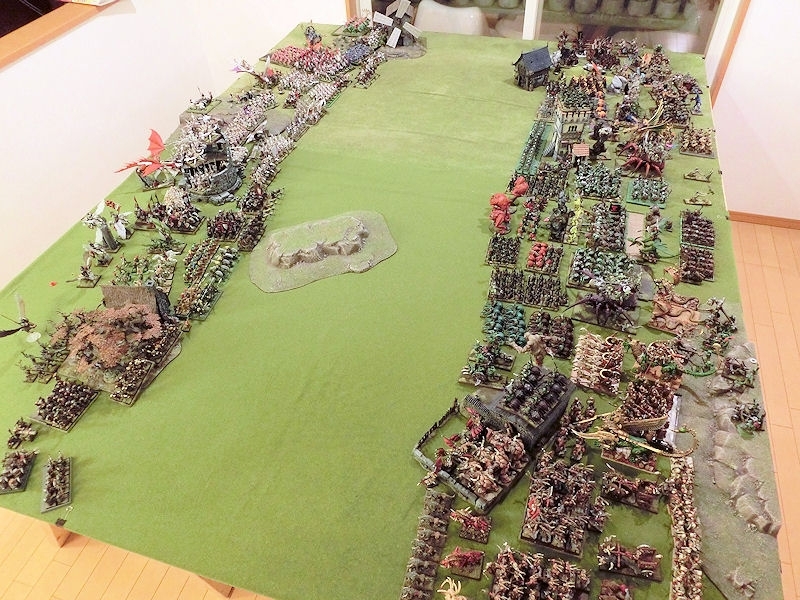 It's so very inspiring to see tables groaning under the weight of beautifully painted models (thanks, Ross for the loan of your beasties, by the way), and I hope that I can continue this tradition of grand battles in another couple of years perhaps? I was once a player of Mage Knight. I really liked the game, the idea of monsters weaking up as they took damage, the combination of attacks and strategies. It was awesome. 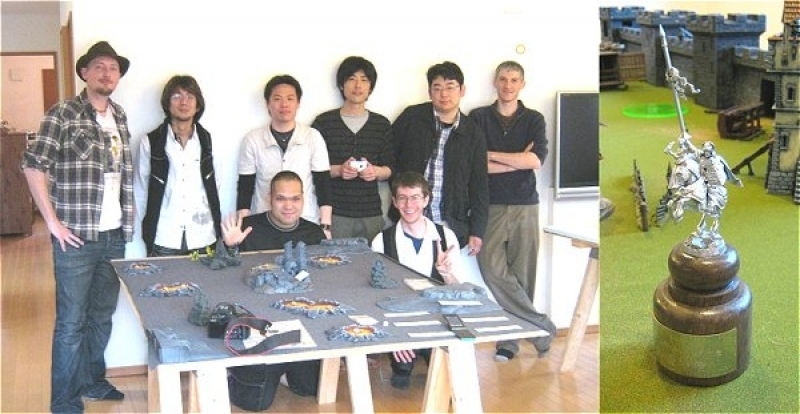 I participated from time to time in tournaments and even without buying many miniatures with some kind of strategy I managed to be ranked reasonably well. I remember that I was the only guy playing with a team of orc volunteers (yes, the cheapest unit in the game which start the game unable to attack). Someday I went back to play the game and there was no more. Mage knight disappeared from Earth with the money-eager strategy of a sports-focused company called Topps that bought Wizkids at the time. Topps changed the rules of the game completely and made all past miniatures unplayable in tournamets, killing all of their past consumers. So I do understand your feeling and I hope that WHFB survives this moment of turmoil. I do not support this kind of greedy-actions from a company. I will start and continue playing WHFB in the same way that I am and will always still play Mage Knight 1.0.